Check valves, or one-way valves, are designed to stop backflow and, ultimately, to protect pumps and compressors. They are available in several styles and sizes, from 1/8 inch to as large as may be required. Check valves are found in many industries and with various applications ranging from municipal water to mining and natural gas. The three most common types are swing check valves, double-door check valves and silent spring-assisted axial flow check valves. 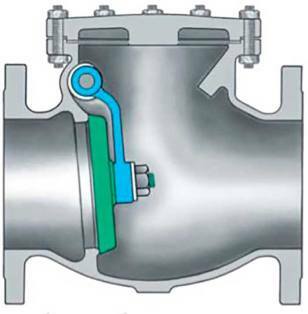 This is probably the most common check valve in use today and is a full-port design, meaning the disc, when fully open, is out of the flow stream. This style of check valve is a good choice in applications that have a high percentage of solids and a lower on/off cycle count. 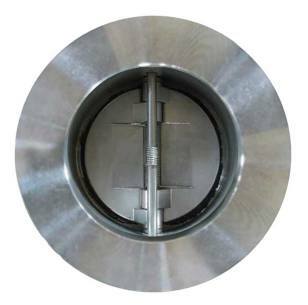 Due to the travel distance of the disc, swing check valves close slowly. This causes the last push of reverse flow to slam the disc closed, resulting in a huge pressure spike, causing water hammer. Water hammer is a pressure surge when a fluid in motion is forced to stop or change direction suddenly, causing a pressure wave in the pipe. This pressure wave can cause major problems from noise and vibration to pipe collapse. This valve is similar to the swing check and a little better in terms of closing because of the coiled springs that assist the two cantilevered doors in closing more quickly. It has been proven that this is not the best choice when faced with water hammer, though they will perform better than a swing check valve. Generally, this style of valve is considered an off-the-shelf commodity valve with little customization available. These full flow valves typically incorporate a center guided stem-disc assembly along with a compression spring. This means the disc stays in the flow stream. The media flows around it and does not require manual or automated assistance to operate. When the pump is running, the valve is open. When the pump shuts off, the valve closes slightly before the reversal of fluid flow, due to the compression spring force acting on the disc, which nearly eliminates water hammer. Most requests for check valves take into consideration the line size and pressure class alone, as media pressure and flow can vary dramatically where pipe designs are oversized for future concerns or undersized due to lack of or incorrect information. This is not always the best way when deciding which style of valve to use in a system. Other things to consider are working pressure, flow rate, the specific gravity of the media and temperature. An analysis of the system design is highly recommended. It is necessary to understand why valves fail and the root causes. The most common failure is due to excessive wear of the internal parts of the valve. Springs, discs and stems wear prematurely by not being held steady during operation. When the disc is not stable due to insufficient flow to hold it in the full open position, chattering can occur. 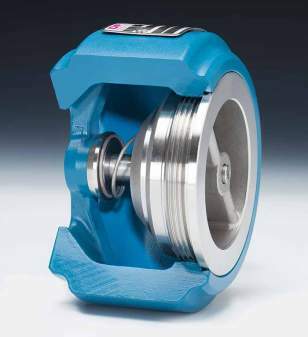 What is Meant by check valve Sizing? Sizing a center guided valve is not difficult. Along with the pipe size, pressure class and type of valve required (flanged, wafer, etc. ), users need the actual working pressure, flow rate, media type, temperature and the specific gravity of the media. It may be as simple as building the valve with a lighter spring to allow the valve to fully open. In order for the valve to reach the full open position, it may need a lift limiter to reduce how far the disc travels. When the valve is 100 percent open, it will be stable in the flow and will result in reduced premature wear and failure by eliminating the effects of chatter. It is very important to remember that these valves are designed to the actual flow values and not to the line size. A properly sized valve will be in either the full open or closed positions. It can protect a system from costly failures and downtime of a production facility. The valve lifespan can be greatly increased by reducing the risk of parts breaking off and damaging equipment downstream. It protects the pumps that are upstream by not allowing backflow, which can cause the pump to spin in the reverse direction and cause severe damage. It leads to better pump and compressor protection. It results in less piping vibration. There is a reduction in water hammer issues. It will work in the vertical down flow direction. How long does the off-the-shelf valve last? What does it cost to change it? How much revenue is lost while it is being replaced? Replacing a valve can be quite costly based on the effects of lost revenue, wages and the cost of the replacement valve. The price of an off-the-shelf valve may be attractive, but what is the real cost of ownership? If a sized valve costs five times as much, but lasts five times as long, consider how these affect the financial balance given maintenance costs and lost production. While there are applications where double-door and swing check valves operate properly and are required, it is not true that these and other off-the-shelf valves are the only solution. In any application where check valves are being used, having a custom valve installed could enhance the performance and extend the lifespan of the piping system. This translates into more value and overall, long-term cost savings. Bruce Ellis is an inside sales consultant at Triangle Fluid Controls Ltd. He may be reached at bruce@trianglefluid.com or 613-968-1100. For more information, visit trianglefluid.com.